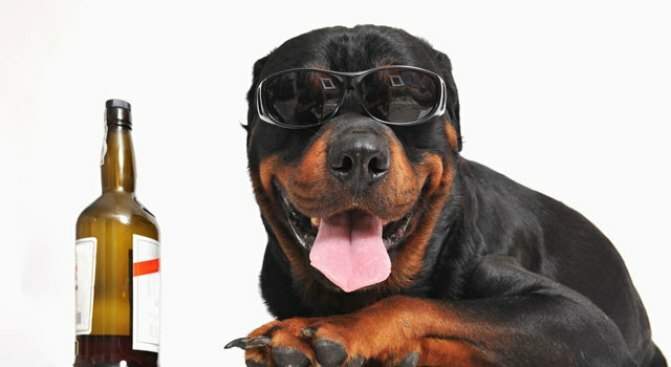 Is It Wrong to Get Drunk With Your Dog? You think he's wearing the sunglasses because he's hung over? We certainly hope not -- he's only four years old! This Wednesday, you won't have to leave your four-legged friend at home when you head out for happy hour. As the latest in a steady stream of dog-friendly your-dogs-are-your-fake-children events, the Park Hyatt Hotel (24th & M streets N.W.) is hosting its second annual Canine and Corks Happy Hour. From 6 to 8 p.m., bring your furry friend to the hotel's outdoor courtyard (adjacent to the lobby). For just $10, you get 2 drink tickets -- one for beer and one for wine (gah, didn't they tell the hotel never to mix? ), while your pup can delight in a complimentary water bowl and dog treats. All proceeds will benefit the Washington Humane Society. During the event, the humane society's mobile unit will be on site for visitors to meet adoptable animals from their shelters and maybe provide these adorably needy pets with a new home. It's official -- this event is sure to be the most heart warming (in mutiple ways) EVER. Just don't get so sloshed you end up bringing home a dozen dogs, because you might have some explaining to do in the morning. So here's to the cutest happy hour around. Woof woof!